Since Jose Lobaton was traded away to the Washington Nationals today, I wanted to look back on his biggest moment of his career with the Rays. Although we ended up losing the series, Jose Lobaton hit a dramatic walk-off home run to win Game 3 of the ALDS. His homer landed in the Rays Tank, making him the first Rays player to hit a long ball into that part of the park. Luis Gonzalez (Dodgers) & Miguel Cabrera (Tigers) were the only other players to also hit a ball into the tank. I want to wish Jose Lobaton the best with the Nationals and I hope he finally gets a big Ice Cream endorsement deal! PS - I love that this video uses Dave Wills' radio call of the play! "Splashdown! It's ice cream time! As you all know by now, we are always looking for ways to get our readers the cheapest Rays tickets possible. This is where ScoreBig comes in (not to mention we have a $50 site credit giveaway below!). Find the game that you want to go to. Select the seating area that you want to sit in. Tell ScoreBig how much you want to pay for those tickets. When looking at tickets, ScoreBig will let you know the face value of the seats and let you know what % of savings other users are seeing at that time. This will give you an idea of what your price offer could be. You will need to fill in your payment information and then will find out immediately whether your offer was accepted. All tickets are guaranteed and you will never pay any fees or shipping cost. It really is as easy as that! We think you should definitely keep ScoreBig in mind when looking for your Tampa Bay Rays tickets this season. Not only does ScoreBig provide good deals on Rays tickets, but they have been kind enough to provide a $50 site credit for a giveaway. If you would like a chance to win, please follow the steps below in the Rafflecopter widget. The only step that is mandatory is to "Like" ScoreBig on Facebook. You may complete other steps for more chances to win (including daily tweets about the contest). The contest ends on 2/18/14 (11:59 PM). The winner will be chosen on that date and must respond within 48 hours. If the winner does not respond, another winner will be chosen. The 2014 season is quickly approaching and excitement is building for what looks to be another amazing season. We all know that the Rays put a great product on the field, but we wanted to pull together a "To Do" list of all the great things you can do while at Tropicana Field. Is something missing? Have you done everything on our list? Let us know below! 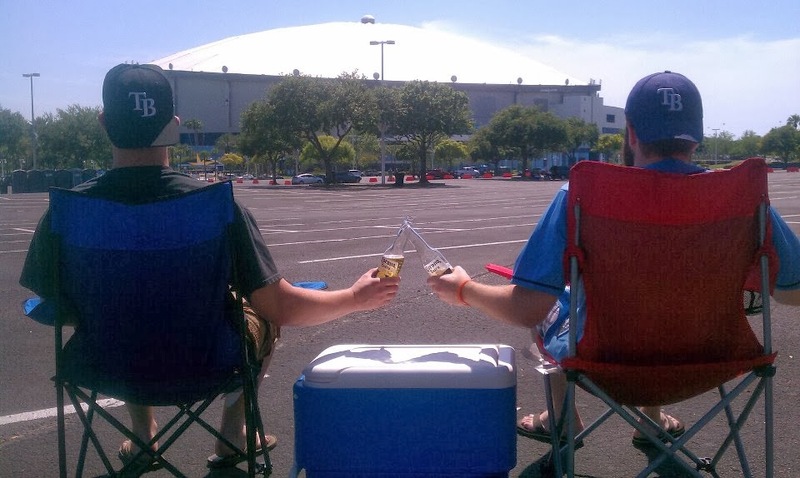 Tailgate before the game (Parking Lot or at Ferg's). Get a Rays Game Day Giveaway. Meet a player/get an autograph. Be the Play Ball Kid. Throw out the first pitch. Take pics in the Gate 1 Rotunda. Sit in the Hancock Bank Club. Sit in the Papa John's Bullpen Box or 162 Landing. Watch from the Captain Morgan Deck. Win the Tradewinds Cabana Seats. Sit in every other section (First Base Line, Third Base Line, Outfield, Press Level, Party Deck, Upper Deck). Walk around the whole field (Rays 360). Play a mid-inning game with Rusty Kath (ex. Spot The Cow). Play carnival-style games on Left Field Street or Right Field Street. Find Todd Kalas (You will typically find him near large groups of ladies!). Visit the Ted Williams Hitters Hall Of Fame. Visit the 162 Landing exhibit. Visit landing spot of Wade Boggs 3000th Hit (Yellow Seat in Sec 144). Visit landing spot of Dan Johnson's HR from Game 162 (White seat in Sec 140). Visit the Rays Touch Tank. Tour the Rays Clubhouse during Fan Fest. Have a cigar at Cuesta-Rey Bar. Eat a Rays Dog (Kayem Footlong). Drink a Captain Morgan Blue Storm. Grab a Craft Beer from The Brewhouse or Curley's Corner. Dance to Cotton Eyed Joe. Ring your Cow Bell (Cow Bell or not, just get loud!). Get on the Rays Wall Of Fame. Win an in-game raffle (50/50, Community Corner, Designated Driver, Etc.). Get a free pizza from Kane's Furniture if the Rays get 10 K's. Shout "VICTORY" after a Rays win!